Sperry Corporation has been awarded a $62.8-million definitized contract by the U.S. Naval Sea Sys- tems Command for engineering, de- velopment, integration, and produc- tion support of combat systems on 11 Perry Class (FFG-7) guided-mis- sile frigates. New COPPER BLAST is a premium- quality, all-purpose copper slag abrasive with more cleaning power for your money. COPPER BLAST is well- screened to retain only the particles that do the job. You don't pay for dust which does no work. 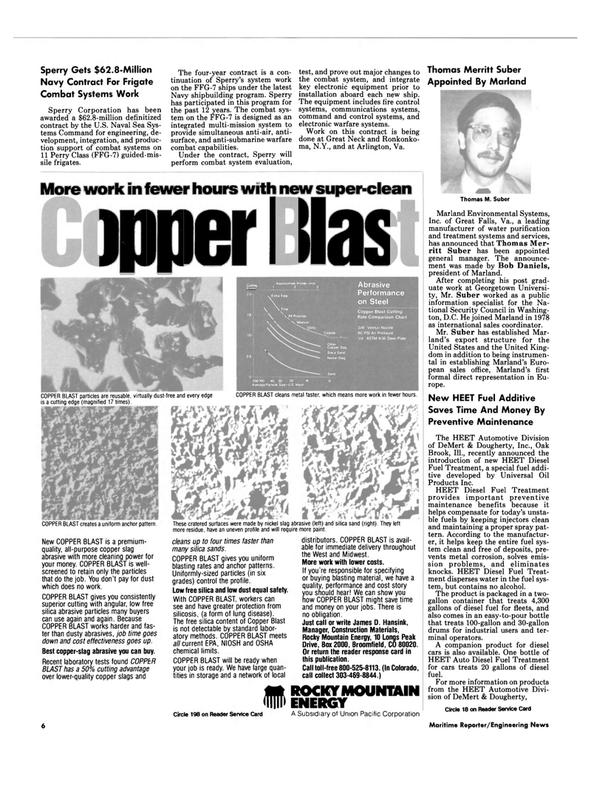 COPPER BLAST works harder and fas- ter than dusty abrasives, job time goes down and cost effectiveness goes up. Best copper-slag abrasive you can buy. Navy shipbuilding program. Sperry has participated in this program for the past 12 years. The combat sys- tem on the FFG-7 is designed as an integrated multi-mission system to provide simultaneous anti-air, anti- surface, and anti-submarine warfare combat capabilities. Under the contract, Sperry will perform combat system evaluation, cleans up to four times faster than many silica sands. COPPER BLAST gives you uniform blasting rates and anchor patterns. Uniformly-sized particles (in six grades) control the profile. Low free silica and low dust equal safety. With COPPER BLAST, workers can see and have greater protection from silicosis, (a form of lung disease). The free silica content of Copper Blast is not detectable by standard labor- atory methods. COPPER BLAST meets all current EPA, NIOSH and OSHA chemical limits. COPPER BLAST will be ready when your job is ready. We have large quan- tities in storage and a network of local test, and prove out major changes to the combat system, and integrate key electronic equipment prior to installation aboard each new ship. The equipment includes fire control systems, communications systems, command and control systems, and electronic warfare systems. Work on this contract is being done at Great Neck and Ronkonko- ma, N.Y., and at Arlington, Va. distributors. COPPER BLAST is avail- able for immediate delivery throughout the West and Midwest. More work with lower costs. If you're responsible for specifying or buying blasting material, we have a quality, performance and cost story you should hear! We can show you how COPPER BLAST might save time and money on your jobs. There is no obligation. Drive, Box 2000, Broomfield, CO 80020. Or return the reader response card in this publication. Inc. of Great Falls, Va., a leading manufacturer of water purification and treatment systems and services, has announced that Thomas Mer- ritt Suber has been appointed general manager. The announce- ment was made by Bob Daniels, president of Marland. After completing his post grad- uate work at Georgetown Universi- ty, Mr. Suber worked as a public information specialist for the Na- tional Security Council in Washing- ton, D.C. He joined Marland in 1978 as international sales coordinator. United States and the United King- dom in addition to being instrumen- tal in establishing Marland's Euro- pean sales office, Marland's first formal direct representation in Eu- rope. HEET Diesel Fuel Treatment provides important preventive maintenance benefits because it helps compensate for today's unsta- ble fuels by keeping injectors clean and maintaining a proper spray pat- tern. According to the manufactur- er, it helps keep the entire fuel sys- tem clean and free of deposits, pre- vents metal corrosion, solves emis- sion problems, and eliminates knocks. HEET Diesel Fuel Treat- ment disperses water in the fuel sys- tem, but contains no alcohol. The product is packaged in a two- gallon container that treats 4,300 gallons of diesel fuel for fleets, and also comes in an easy-to-pour bottle that treats 100-gallon and 30-gallon drums for industrial users and ter- minal operators. HEET Auto Diesel Fuel Treatment for cars treats 20 gallons of diesel fuel. COPPER BLAST particles are reusable, virtually dust-free and every edge is a cutting edge (magnified 17 times). COPPER BLAST cleans metal faster, which means more work in fewer hours.